Once again, I struggled with this picture. I remember having to bribe them with going to the playground last year to get them to sit on the step (this year the bribe would have to be lots of chocolate). 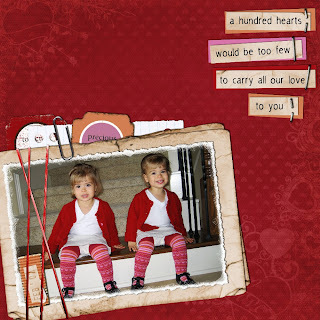 Their sweaters were just SO red and most of the Valentine's stuff I found was pink - so with a bit of recoloring and after a trial with a template that just didn't work I went searching for inspiration and found a page to "lift". Played around with blending again - applied a soft light blend to the photo to give it a bit more pop. Glue seems to be popping up on LOs these days so I was able to recreate that - its just a tiny detail on the date tag, but now I should be able to repeat that again. I made quite a few of my own elements - see all the actions I ran. I'm figuring out more about brushes and while I didn't use any in the end I think I know now how some papers are created. Still lots to learn there though and I really don't have to be a designer anyway. From this blog post forward I will just be pointing you to the designer - it was taking a bit of time to dig down to the exact item and I don't know that anyone is using the links anyway. Beautiful as always! and thank you for entering my CT competition. Sorry I have been so slow to personally thank everyone who entered. I did appreciate your layout very much, and I hope you had fun creating it. You always do fabulous work!! Look out! You'll designing soon LOL.